The era of the French Revolution and the Napoleonic Empire had ended in 1815, with the Church humbled by years of persecution. 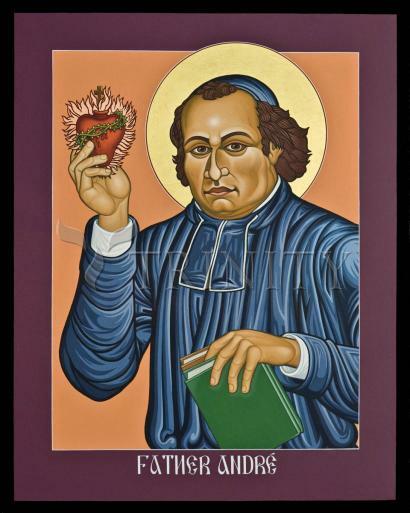 Ordained in 1812, André Coindre was one of a new generation of Catholic clergy committed to the revival of the Church and its mission to the poor. As a chaplain in the squalid prisons of Lyon, Fr. André realized that juvenile delinquents had little hope of rehabilitation. He established a haven in which young offenders were provided vocational training and Christian formation. In 1821 Fr. André established the Brothers of the Sacred Heart to work both in Lyon and in rural villages where illiteracy was rampant. He also worked closely with St. Claudine Thévenet and the Religious of Jesus and Mary to meet the needs of poor and abandoned girls. His size and demeanor, as well as his fiery rhetoric, helped convert and inspire a range of the populace from prisoners to wealthy benefactors. Yet it was the delicacy and tenderness of his compassionate heart that drove him. The heart he found in others, and others saw in him, was the incarnation; Christ present in the distressing guise of troubled and impoverished children. This Sacred Heart of Jesus became the image and the name under which his community of Brothers have served youth to this day. b. 2.26.1787 – d. 5.30.1826. The Brothers of the Sacred Heart is a Catholic congregation founded in 1821 by Père André Coindre, of the Diocese of Lyon, France. Its constitutions were modeled upon the constitutions of St. Ignatius based upon the Rule of Saint Augustine. Its members bind themselves for life by the simple vows of religion. There are only a few priests in the congregation, the vast majority of its members being lay brothers who live in community in accordance with the Congregation's Rule of Life. The objective purpose of the congregation has evolved slightly over the years - though its fundamental mission remains centred on the education of the young: in asylums, parochial and select schools, and commercial colleges. The early growth of the congregation was slow. At the period of its origin the socio-political condition of France, a country in political agitation and revolution, was very unfavorable to the growth of religious communities. Lyon, the cradle of the congregation, suffered sorely in these tumultuous early revolutionary days. However, a more hampering difficulty to its growth lay in the ill-defined government imposed upon the congregation. Following the death of Père André Coindre, the superior-general, his brother, Père Vincent Coindre, succeeded him in this role. In 1840, Père Coindre assembled the general chapter of the congregation. During the discussions of the chapter, opinion among the brothers was unanimous that it was necessary for the success of the congregation that its temporal affairs should be in the hands of the brothers themselves, and that one of their number should be superior-general. The question was referred to Mgr de Bonald, Archbishop of Lyon, who, after an exhaustive examination, judged it advisable that Père Coindre should resign the office. On 13 Sept., 1841, Brother Polycarp was unanimously chosen by the brothers as their superior-general. He reconstructed the government of the community and gave it stability and permanency. At the time of his death in 1859, there were in France alone seventy three establishments, an increase of sixty during his administration. He had, moreover, in 1846 opened up in the United States, at Mobile, Ala., a new field of labor for the institute. In 1872 the province of the United States extended its schools into Canada, and in 1880 transferred its novitiate from Indianapolis to Arthabaskaville, Canada. The growth of the congregation was here so rapid that it was deemed advisable to erect the establishments in Canada into a separate province. This was effected by a decree of the general chapter of the society held at Paradis, near Le Puy, France, in 1900. About the same time a house of studies for postulants and a novitiate for the United States province were established at Metuchen, NJ. Not unlike many other religious communities in the Catholic Church, the order saw a tremendous surge in vocations following the Second Vatican Council. However, as its school in St Albans testifies, a substantial number of these men subsequently left the order. Africa and South America remain the two regions where vocations to the order are at their highest. The order holds that its founder Father Andre Coindre preached and acted upon the spirit of compassion that Jesus exemplified through his own life. By responding to the abandoned youth in the city of Lyon, Father Coindre gave of himself, of his own heart. The Brothers of the Sacred Heart are called to respond just as Father Coindre, just as Jesus did. This spirit of compassion is what motivates the Brothers today. "The Father so loved the world that he sent his son to live in it. And the Father still loves the world, still wants his son to live in it, and not just in spirit."